We were recently back in Denver after a long hiatus between visits, and we had the distinct honor of joining some friends for their first legal cannabis purchase. Because of their relative inexperience with retail marijuana sales and perhaps even some lingering unease due to decades of hiding this leisure activity, they looked to us for guidance, and because we’d heard great things from knowledgeable people about Good Chemistry’s new Aurora shop, we decided to start there. We were all glad we did. 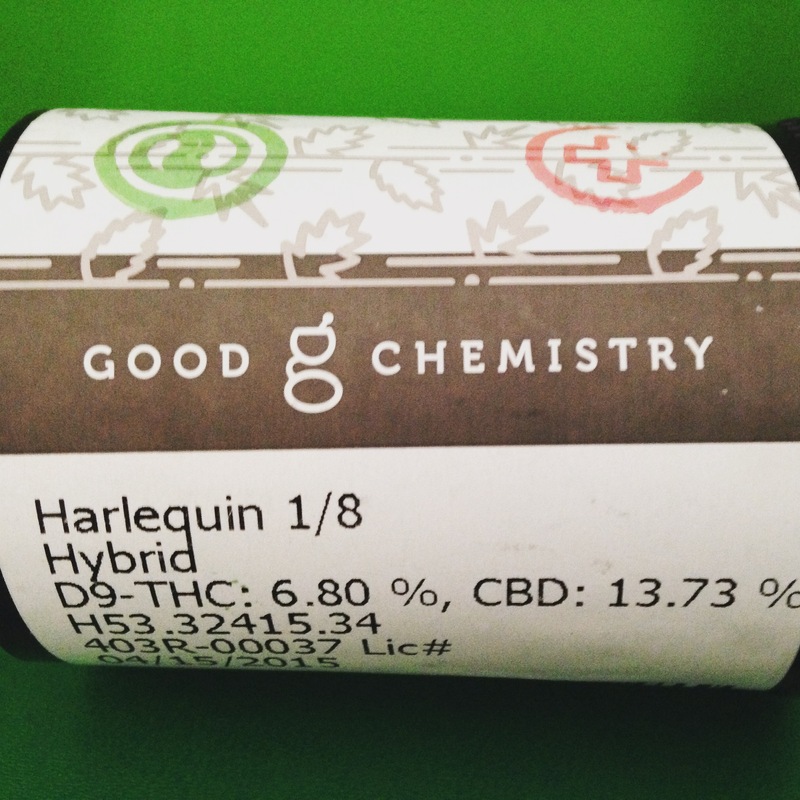 Good Chemistry was the perfect destination for our entire group, and they have certainly raised the bar for a cannabis-buying experience, from the hospitable front desk service to the browseable, beautifully designed, informatively executed sales floor, from the budtenders to the prices to the product. It is easy to find Good Chemistry and easy to get to the Aurora store from Denver with our rental car. On a major road, plunked in the middle of a strange shopping center that houses a variety of diverse religious establishments, its location gives us hope that maybe there is a place where everyone can get along…and maybe cannabis is at the center! The convenience and navigability continues with plenty of parking surrounding the building and a well-designed exterior that hints at the attractive and sophisticated space inside. 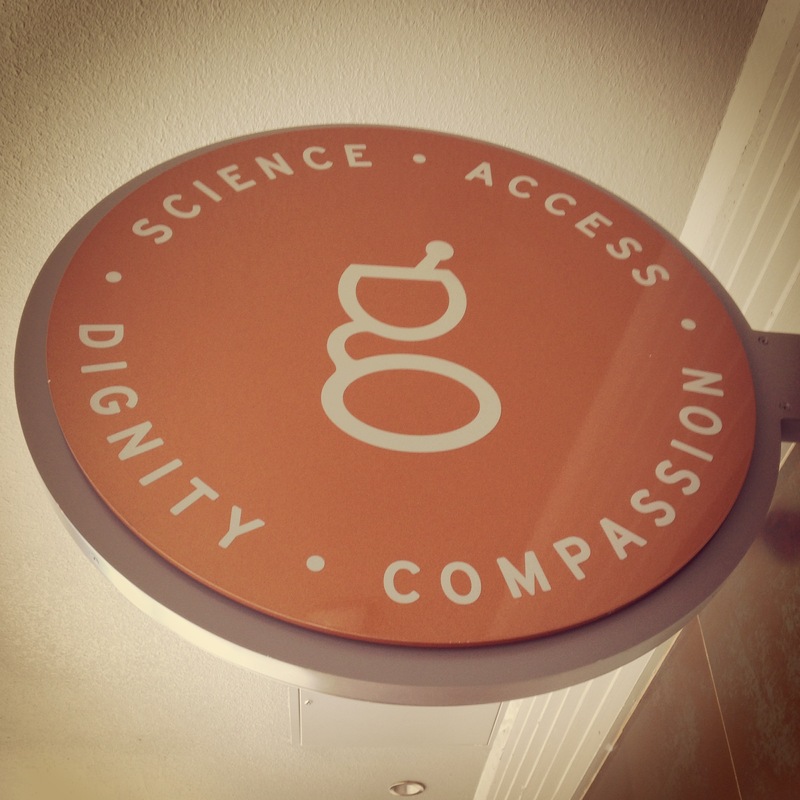 Signage is simple, clear, and classy, with the logo’s lowercase ‘g’ emphasized on both the building’s façade and the hanging sign by the door, which advertises Good Chemistry’s four core principals: science, access, dignity, and compassion. The front door opens to the reception area and front desk, a sizeable stained wood and metal section of the room. The store’s dark grey walls begin in this space, and we start to see the pops of green, orange, blue, and yellow that accent the décor. There are a few chairs, but we don’t need to use them. The woman who greets us has a big smile and a friendly voice. She checks our identification carefully and welcomes us to Colorado, then explains to the red card holder in the group that while this location is strictly recreational, he will receive a 10% discount on his purchase because of his medical status. We notice that there’s an ATM inside and that, in Aurora, you can visit Good Chemistry from 8 am until 9:45 pm. The five of us are allowed to go in together, and it’s immediately evident that there are some major differences between Good Chemistry and your typical marijuana establishment. First, the reception area is clearly the smaller of the two spaces, because the showroom is huge. This is not often the case with retail cannabis stores, and we’ve exited empty, spacious waiting rooms only to be crammed up against the counter of a tiny sales room more than once. At Good Chemistry, though, they save the best real estate for the place where you’re spending most of your time (and all of your money…), and they provide you with plenty of stimuli throughout. We follow a short hallway between the front room and the actual sales floor, decorated with the motto “Making Life Better” and wall panels that categorize the effects of cannabis: relaxation, relief, sleep, and stimulation. As we pass the brightly colored resources, we can’t help but stare at the photo canvases directly in front of us, pictures of the plant in all stages and information about Good Chemistry’s nurseries. When we can take your eyes off of the gorgeous images, we need a moment to behold the showroom. There’s space to wander and look at the captivating and education wall hangings and display shelves. Customers can browse the branded merchandise, such as sweatshirts and winter hats as well as shelves filled with quality cannabis accessories. A glass cabinet at one side of the room displays marijuana stalks hanging upside down, in curing position, and, in the middle of the floor, four stations with tablets beckon you to research the available strains according to your desired effects. The whole place has a sleek and refined feeling, the dark grey walls accented by their four bright colors, the lighter grey tiled floors illuminated by track lighting and glowing hanging lanterns. It’s actually quite stunning. Patrons are free to walk around the room, taking it all in, at their own pace; they don’t have to go straight to the counter to speak with the budtender. 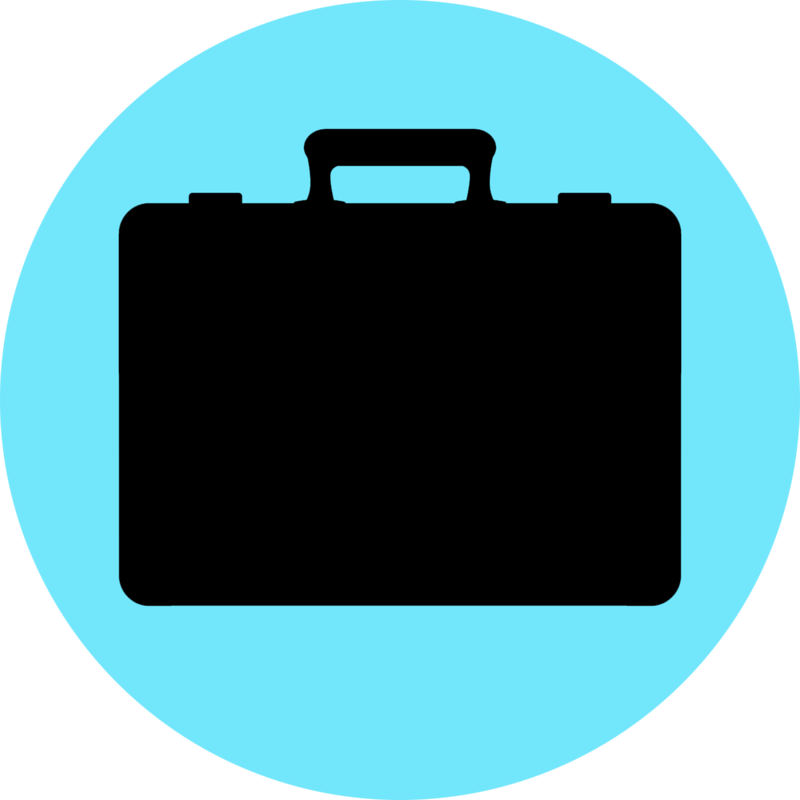 Of course, you can, and the employees are ready and willing to help, but our experience isn’t dictated through that interaction. 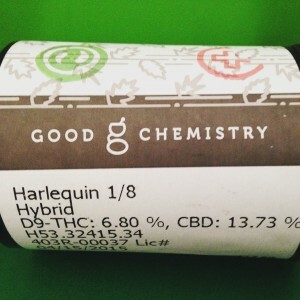 We peruse at our leisure and consult the budtender when we have questions and when we’re ready to purchase, but we appreciate that there were many ways to access information at Good Chemistry. This feels closer to shopping for other commodities, like going to a bookstore or a clothing boutique. Our group consisted of a broad range of consumers: red card holding medical patient, homegrower, strain expert, and first-time buyer. The fact that we all loved Good Chemistry beyond words speaks to the thoughtfully designed space, the strength of the service, and the quality of the product. We were most impressed with the budtenders’ ability to assess their customer’s “cannabis identity” and adjust their conversation and information accordingly, and we appreciated that there was a lot to look at while we waited for our less experienced companions to muster the nerve to purchase cannabis and to ask the questions they’ve always wanted to ask. Good Chemistry Aurora is definitely a new favorite and well worth the trip to Aurora. It’s also an incredible place to have your first legal shopping experience, and frequent visits will ensure that you’re well on your way to becoming a conscious connoisseur. You can’t help but have high expectations when you start here. Posted in Colorado, Reviews, Shops and tagged concentrates, desired effects, Dixie Elixirs, edibles, flower, Good Chemistry Aurora, Harlequin, high CBD, hybrid, indica, Ingrid, Making Life Better, sativa, science access dignity compassion, Sweet Grass Kithen, The Happy Camper, tinctures, topicals. ← More Cannabis Reforms Coming for Denver?